nnnneeee, nnneeee……. That’s the sound mosquitoes make. Not buzzing. Bees buzz; a relaxed buzz if checking out flowers, higher in pitch if disturbed. But mosquitoes have an annoying, high-pitched little noise like a tiny banshee. I quickly closed the door just as two dark flashes went by. I ran over to my bedroom window and it was a pair of mallard ducks that landed on my lawn. (oh, the green on the male’s head is so beautiful!) I watched them walk around the lawn over to the part that hasn’t been mowed and look for slugs or whatever. How can they walk in that wet grass and not be bothered by mosquitoes? was all I could think. They went behind my woodshed…… I’ve been around the house and can’t see them anymore. Today would be so good for working outside because it’s not hot but it’s cloudy. The grass is wet….. it will take a full arsenal of spray, clip-on OFF! and a mosquito net/ hat. OR….. I can stay inside all day, putter and laze. I can puff for my own buzz. 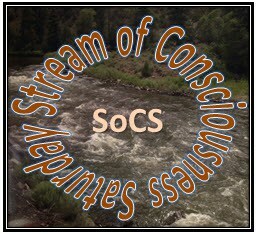 Oh, Stream of Conciousness Saturday…… now I can’t go back and change all the sentences that start with ‘I’! Ooh, I absolutely hate the noise those things make. That is a great name for them. Little screaming insects. I have always been afraid of bees, but at least they do not sound like the pesky mosquito. I shudder when I hear that high-pitched wining in my ear. Swat. Swat. The first night away from home, at camp when I was ten, the teacher left the room door open into the hallway, just a crack, to let some air in. Big mistake. I got hot anyway because I had to keep my head buried under the blankets, just to keep an irritating little pest from making that dreaded noise in my ear all night long. Don’t you just hate how they lie in wait in the grass like that?